At a meeting two weeks ago, Summit Toastmasters had a returning member (John Welsh) who remembered a speech I did on this premise called “The Real Toastmaster.” What was amazing…I did that speech two years ago. Just goes to show you the power of HUMOR! 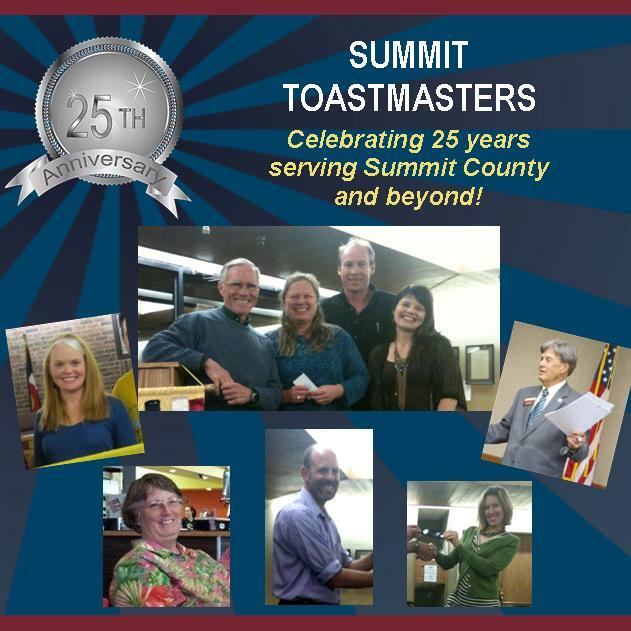 When I joined Toastmaster in June, 2010, I would have to say I felt bad about my speaking. It wasn’t that I was afraid to speak in public – it was that I didn’t have the confidence that HOW I said, what I said -would have the impact I intended to have on my audience! I joined Toastmasters to give me the confidence to be an effective speaker. I had no intention, desire or inclination to be a humorous speaker – that was completely outside the realm of how I ever saw myself! But in August of 2010 we started talking about the upcoming humorous speaking contest. My palms started to sweat, my respiration increased and I got a bit queasy in my stomach. All signs to back away. I thought to myself, I could be a judge – or a timer. Then I thought , “Well, wait a second. I am here to learn to stretch myself in uncomfortable situations. I am not here to hide – I am here to grow!” So I tentatively raised my hand and volunteered to be a speaker! It was horrifying – but I had done it! A week went by with almost no sleep – tossing and turning – what was I going to talk about? How was I going to make it funny? What on earth was I thinking! I wonder if I could get out of it. Could I call in sick? Should I just quit? That book spoke to me. Nora and I were like sisters our stories were so alike. That’s when I decided I would do a take-off on Nora’s and my story! I crafted my speech – it was too long. Oh what to cut? I finally got it down to seven minutes! I presented it to my husband. He said, “That’s’ very good!” But I could tell he “didn’t get it!” So I modified it to add a way to include men. Then I gave it at a small dinner party. That was the worst! There was small polite twitters of laughter – nothing uproarious that would be needed to win a contest. I modified it again. When I got to the first contest imagine my delight when most of the judges were women about my age! They knew exactly what I was going through – we’re ALL going through it. The younger women just haven’t learned that they need to appreciate their necks now, while they still can. Well, the rest is history. After two more contests and more fine tuning, with the help from fellow toastmasters, friends and complete strangers, I finally had a speech that was worthy of the Toastmaster’s District 26 Humorous Speech Contest! Yes. I won it! From believing I would rather call in sick, or quit to winning the District Champion! I challenged myself, got out from under the fear and stretched my wings. I didn’t just fly, I soared! It was and still is an amazing feeling. I urge you to stretch your wings and soar! You’ll be glad you did! Tis holiday toasting (not roasting) season! Speak slowly and clearly and keep what you say brief and heartfelt. The speech should be four or five sentences, lasting less than a minute. Make sure that your tone and content are appropriate for your audience. End your toast by inviting everybody to toast the host. Excellent video on how to give a toast at a special celebration with Town & Country magazine’s editor-in-chief Pamela Fiori. In Summit County, there is a homebuilder who does all of the luxury homes in the area. If you were building a 3000 square foot home with all of the bells and whistles, Alan was your man. His best superintendent, Pat, had been with him for 30 years carefully building each home from the ground up. Pat: Alan, I’m ready to retire. Alan: Pat, you can’t retire. I have one more home that needs to be built. Pat: No, I’m ready to retire now. Alan: Pat, you’re our best. I need you to do this one last home. Do the foundation, and I’ll let you retire. So Pat agrees to do the foundation for this last home. While she is building the foundation though, she decides that she will show Alan. She will build the foundation and the rest of the house as quickly as possible. Pat: Hey Boss, I’m finished! Can I retire now. Alan: Just a moment, lets do a walk through and then you can retire. I need you to tell me where you got everything in case the new owner has any changes or warranty items. Both Alan and Pat go to the home. From the outside, everything looks perfect, just like a million dollar home. Pat is getting worried as they come to the front door though because she had cut some corners on the inside using inexpensive fixtures and cheep construction techniques. Pat, you have been a valued employee these past 30 years. Keep the key, we had this home built for you in appreciation for all of your hard work. Always do your best because you never know who’s house you are building.